The 22.5 metre sailing yacht La Luna, jointly listed for sale by Jim Acher at bluewater and Berthon International, has had a currency switch from sterling to euros, meaning an effective price cut of €600,000. She was built in composite by King Marine to RINA class in 2008 to a design by Bill Dixon and refitted in 2010. The refit included a new carbon mast and boom from Hall Spars with in-boom furling, new paint, rigging and high tech Doyle sails. A true blue water cruiser, she can sail easily in light airs and has proven capable of sustaining winds of 60 knots plus offshore. Her vast cockpit is ideal for al fresco dining, fitted with a large table and fridge and in 2011 she sailed from Antigua to Palma in only 19 days. The main saloon provides panoramic views, has comfortable seating and leads down to the galley. The well-equipped galley has separate stainless steel fridges and freezers as well as a Miele electric oven with gas hob, a dishwasher and ample storage. Her foredeck is totally clear and her sail handling systems are designed around simplicity, reliability and ease of use for short-handed and extended passage making. RINA classed and MCA compliant, with generous volumes and a high quality interior finished in haya beech over stainless steel kickplates, this yacht for sale accommodates six guests comfortably in a master suite and two double cabins, all with air conditioning and en suite shower facilities. Under power, La Luna’s 250hp Lugger engine gives her a cruising speed of nine knots. 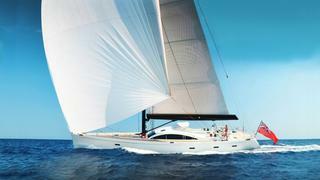 Currently sailing back to Palma de Mallorca, Spain, La Luna is now asking €1.5 million.